Not-for-profit organizations face new opportunities for receiving support from their community, and one of the fastest growing resources comes from crowdfunding platforms. Crowdfunding, the practice of using a broad base of contributors through established online platforms, promises to surpass venture capital as a financing source in 2016, according to a report from MassSolutions. Online platforms are growing in popularity in part because participants do not have the same barriers to entry in order to invest in companies, projects and other initiatives. Minimum income requirements for investors are low, as is the minimum contribution amount. Not-for-profit organizations can use crowdfunding for a number of organizational functions, from specific projects to broader causes and general support. Several platforms even target those who want to give altruistically by matching them to charitable organizations. Maximizing the advantages under crowdfunding requires planning because reaching out to a broader base of contributors can come with risks. Not-for-profit organizations should consider the following carefully when determining how to use the crowdfunding tools. The key to any contribution campaign, be it a traditional fundraising effort or crowdfunding, is to have a focused goal in mind and find the right fit for your organization. Some not-for-profit organizations have successfully utilized crowdfunding for construction projects. For example, a not-for-profit group in New York used Kickstarter to raise money for an art studio. In a 30-day period, it exceeded its $16,000 goal. One of the largest crowdfunded campaigns of 2015 involved Morehouse College’s King Chapel. Using Indiegogo the college generated more than $5 million for a new roof and HVAC system for the chapel, among other needed items. Whichever portal or project organizations decide to use for crowdfunding, they should have a clear idea of how that portal aligns with their mission and ultimate objective. The appeal of crowdfunding is that it brings organizations into contact with a broader audience of donors. Not-for-profit organizations that operate with a limited development budget can reach potential contributors on an international scale using an Internet platform at a relatively low cost. Nevertheless, with the popularity of crowdfunding, organizations must develop ways to distinguish themselves from other not-for-profit and for-profit options. For-profit companies can promise returns on investment. Not-for-profit organizations have to be able to demonstrate a different kind of incentive for contributions. Donors want evidence that their money makes a difference to your mission, and the more specific organizations can be about how the money will be used and the measurable results of that project, the more potential donors can see how their dollars will affect change. Organizations may also need to consider what tangible incentives the donors may receive in exchange for their contributions. The not-for-profit in New York that raised money for a new facility sent some of its donors items made by the art studio and invited donors to tour the facility and join the open house party once construction was complete. Just because there’s a large geographic reach for a project doesn’t guarantee a not-for-profit will receive the full funding amount desired for a project. When planning for a project that uses crowdfunding, be sure to have a contingency plan in case the crowdfunding does not generate the return anticipated. If organizations want to use crowdfunding for crucial building repairs, they should also draw from traditional budgeting and planning sources to ensure the project can be completed regardless of what online donors contribute. Online donors also do not have the same relationship with the not-for-profit as donors in the local community served by the organization. If a project experiences an unexpected setback, it may be difficult to go back to an online donor base and explain why the organization needs more funding for a project. Drumming up repeat support for your organization may also be difficult. There is a question of whether the states will enforce solicitation rules to these crowdfunding sites. Most states have requirements for not-for-profits that solicit funds from their residents, and many follow the guidelines set out by NASCO (National Association of State Charity Officials) in the Charleston Principles, which treat online fundraising activity the same as physical fundraising. Regulations vary by jurisdiction, as do filing requirements and deadlines, which can complicate compliance. Online solicitation means that organizations may be registering with many more states than they have previously. Organizations should consult a tax advisor experienced with charitable solicitation statutes before engaging in a national campaign to ensure a plan is in place for meeting multiple-state registration and reporting requirements. Make sure you understand the fees. Sites may charge a percentage based on funds raised, a percentage plus a transaction fee or a percentage of the goal whether it is met. Understand who is responsible for things such as donor acknowledgements. Although there is not yet much IRS Guidance, the rules for substantiation still apply. It appears these sites do not fall under the reporting for professional fundraisers (including disclosure on Schedule G). Watch that the site you select is not set up by a registered fundraiser. 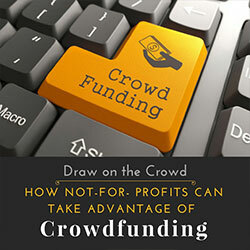 An outside adviser who understands both the unique operating challenges of not-for-profit organizations as well as the considerations for crowdfunding can help bring clarity to whether crowdfunding is a good fit. Betty Isler is a Managing Director in the Tampa Bay office of CBIZ MHM, LLC. She has more than 20 years of experience in public accounting, specializing in providing tax return preparation and planning services for tax-exempt organizations.